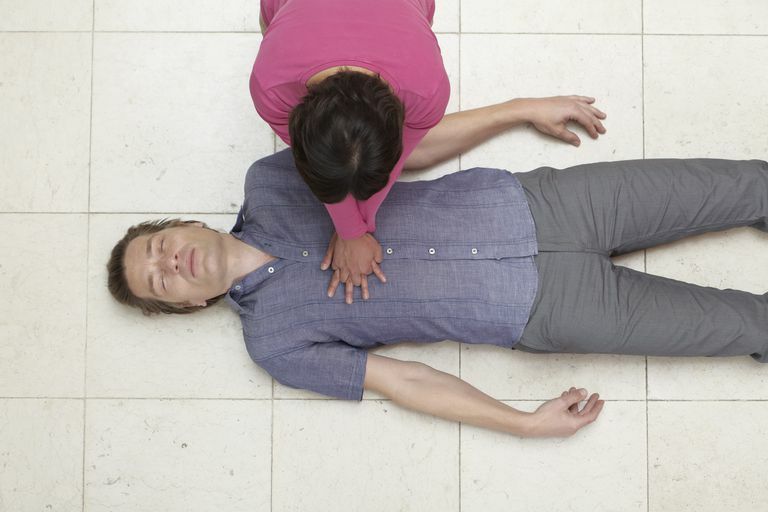 Is it OK to Do CPR on a Person Who is Barely Breathing? A study of CPR patients in Arizona found that gasping breaths (often called agonal respirations) are common soon after cardiac arrest. Many paramedics have arrived to find their unconscious "breathing" patients actually had agonal respirations. Bystanders—worried about hurting the victim—hesitate to start pushing on the chest of a person gasping for air. So, is it OK to do CPR on an unconscious person who is gasping for air? If you're looking at a person you can't wake up and aren't sure if he is breathing, he probably isn't. If the patient is taking such shallow breaths you can't see the chest rising and falling, it's not enough. If the patient is gasping every few seconds for air, it's not enough. Either way, call 911 and push on the chest. When the heart stops pumping hard enough to get blood all the way from the lungs to the brain and back, we call it cardiac arrest. Trained rescuers recognize cardiac arrest by feeling the patient's carotid pulse (located on the side of the neck). If there's enough blood flowing by on the way to the brain, there will be a pulse. If not, there won't. Whether the heart is going through the motions of beating, quivering uncontrollably, racing extremely fast, or lying perfectly still doesn't matter. All that matters is whether there is enough blood making the round trip between the brain and lungs. If not, the patient needs CPR. Some of those patients will be gasping for air, but your friendly neighborhood paramedic won't care. She'll still pump on the patient's chest to help get the blood flowing again. Untrained rescuers use something closer to intuition to recognize cardiac arrest. Simply put, look at the patient. Does he look dead or not? There's a good chance the patient will be gasping his or her last breaths when you first arrive. That gasping motion resembles the last furtive spasms of a fish out of water. It doesn't look like breathing as much as it looks like a reflex of the chest and neck muscles trying to grab a few more molecules of important oxygen. CPR on this patient, particularly hands-only CPR, has a good chance of being effective. CPR is always changing. There's been, and continues to be, a lot of research done trying to determine what kind of CPR is better and who should perform it. In all of this research, there has been a finding to which most non-scientists would say, "Duh!" Simply put: Doing something is better than doing nothing. Good advice, whether someone is gasping for air or not.